The blade flashed as the little nurse passed it over. "Doesn't look good," the surgeon muttered. "This leg will have to come off." "Oh, no!" The little nurse gazed sorrowfully at the limp figure on the operating table. "What a shame for the poor dog - especially after he rescued those City children from the fire." The surgeon shook her head. "He should have got out of the building faster. At least he'll still have three legs. If we lose the leg, we can save the dog." "But he's so badly hurt!" whispered the little nurse. "Nothing that time won't cure. Get ready to clamp." The surgeon busied herself with the saw: its remorseless buzz rasped through the operating theatre. "It'll take time, and money," she went on, "but those are Garracker's orders - save the dog, whatever the cost." "Garracker?" The little nurse froze for an instant, and then glanced around nervously, as if expecting to see him swaggering in with a battalion of bodyguards. "Garracker," said the surgeon firmly. "But why would he say that? Why is Garracker so interested in a dog?" "Not just any dog. This is Officer Admiral Benbow of the City Police, and I'm told he's the best undercover agent they've ever had." "He won't be going back undercover with three legs," mourned the nurse. "There's another reason why he's special," said the surgeon. "He's voiced. One of the few successes. There won't be any more voiced dogs, not until they lift the ban on genetic engineering. More swabs, please." The little nurse handed them over, watching the surgeon's deft fingers at work. "I wonder why so few of those experiments worked," she wondered aloud. "Why don't more dogs have voices?" "It takes more than a voice-box for a dog to speak human," said the surgeon gruffly. "It needs the right palate, jaw, tongue - and most of all, intelligence. No point giving a dog a voice if it has nothing to say." "What a lot of trouble to go to, just to make voiced dogs to police the City." "They had to," said the surgeon. "Human police wouldn't do it any longer - the City got too dangerous. Half of its population are dogs, anyway." "And the other half are children. How many are there in the City?" asked the nurse curiously. The surgeon shrugged. "Who knows? Who cares? If stray children choose to live there, how can anyone stop them?" "I would have thought their parents, or the social workers-"
"Most of them don't have parents. And social workers won't risk venturing inside the City." "I don't blame them," said the little nurse with a shudder. "It's the police dogs who keep the City under control. So if Garracker tells us to save this dog's life, we do it." The surgeon bent over the unconscious body on the table, cutting, swabbing, sewing. The nurse gently touched a ragged ear protruding from the oxygen mask. "Poor Benbow! They said he was going back for the third child when the building collapsed. Are the children he rescued all right?" "Two of them are fine," replied the surgeon. "Just bruises, shock. They'll be out of hospital soon - though goodness knows where they'll go..."
"City children? Someone will find homes for them, surely?" "Or a Home. They might prefer to return to the City." The nurse shivered. She had heard what Homes were like. But even a place in a cold and faceless orphanage must be better than the alternative. "What about the third child?" "Badly burnt," said the surgeon shortly. "Lost an eye. Scarred for life. There we are." She dropped the detached leg with a soft thud into a metal dish. "Finish the stitches," she commanded. "And make it tidy. I've left enough tissue to fit an artificial leg." "Garracker's orders." The surgeon handed the needle over to the little nurse, who began to stitch carefully, anxious to do a good job. It wouldn't do to displease Garracker. "Finished," she said ten minutes later, inspecting her own needle-work approvingly. "Very neat, don't you think?" She turned to see if the surgeon agreed; but she was talking to empty air. The doctor had vanished. The little nurse was quite put out. "Well! Where's she gone? You'd think she'd stay to see the job finished! When it's a hero and all whose leg she's just cut off..."
Her voice trailed away, as she looked around for the dish containing Admiral Benbow's leg. But that had vanished too. The little nurse noticed the girl first; her red hair glowed like a bright flame at the far end of the ward. The nurse trotted briskly past the line of low beds to meet her. "Who are you? What do you want? We've got a ward full of very sick dogs here, and it's not visiting time!" Then she saw a boy hiding behind the girl. His head was tightly wrapped in bandages. A black patch over one eye gave him a piratical look at odds with his small, thin frame. The other eye peered anxiously around the quiet ward. "Natty? Is he here?" he whispered. "He's here, Wilf." The girl patted his hand reassuringly, and turned to the nurse. "Please may we see Admiral Benbow - just for one minute?" The nurse hesitated. She ought to send them packing: but the eye-patch jogged her memory. "Is your brother one of the children he saved?" "Wilf? Yes, that's right. There were three of them looking for mushrooms in an empty building, when the fire started - I don't know how. Admiral Benbow ran into the building and dragged out the other two. He'd just gone back for Wilf when the rafters fell in and trapped them both." "Come along, then," said the nurse, filled with pity for the thin, bandaged boy. She hurried the pair of children towards the bed where the dog lay on his side amidst snaking tubes and wires. Admiral Benbow was a big, powerful dog, one part retriever, two parts German Shepherd, and the remaining quarter... what? The nurse couldn't decide. Something swift and shaggy, like a wolf-hound maybe, except that his jaw was too broad, and oddly-shaped. She checked his monitors: heartbeat steady, condition stable. He lay limply on his side, his coat clean and shining, for the nurses sponged and brushed him daily; but his eyes were closed, and his breathing was soundless. Wilf stared down at the dog's right foreleg. It ended in a neat, bandaged stump. He put up a hand to touch his eye-patch. "I lost an eye, he lost a leg," he murmured. "He's getting a new one, though," said the nurse, straightening the sheet. "A nice, plastic, electronic leg, almost as good as the real thing." Wilf shook his head. "It won't be the same. It won't be the real thing." "He'll hardly know the difference," said the nurse, as a shrill yapping started up at the other end of the ward. "All right, Dodie! I'm coming!" She hurried off to attend to a fretful poodle. Natty gently pulled Wilf's sleeve. "Wilf? We've seen him now. You heard the nurse: he'll be all right. There's nothing else we can do for him." Wilf laid his hand upon the dog's warm, rough flank, feeling its slow rise and fall, like the swell of a quiet sea. "He's looking at me," he whispered, for the dog's eye had half opened, as deep and dark as a well. "He can't see us, though," said Natty. Slowly the eye closed again. "I wish I could do something for him," muttered Wilf. "We will. I promise. But we can't stay here any longer now! They'll be missing you soon on your own ward." "I'm not going back there," said Wilf. "They're talking about sending me to a home." Natty caught her breath. "What?" "They thought I was asleep," said Wilf in a low voice. "I heard the doctor say my dressings could come off next week, and asking where I'd be sent. And someone else said, 'He's a City child. No family. He'll have to go to a home.'" "A home, or a Home?" "I don't know," said Wilf. "I don't want either. You're my home, Natty. You're my family. I just want to be with you - and Admiral Benbow." Natty considered quickly. A good foster home might be the best thing now for Wilf, frail and damaged as he was. But an uncaring home - or worse still, a Home - would be disastrous. She imagined what Wilf would go through amongst unsympathetic strangers, with his terrible scars and his missing eye. Wilf was a City boy. Had been since babyhood. But now life in the City wouldn't be easy for him either. She made her decision. Wilf should have what he wanted. She would look after him, as she had since he was tiny. "All right," she said. "We'll go before we're missed. Let's go now." "Where to?" Wilf stared at her. Wilf gently stroked Admiral Benbow's shoulder one last time, then turned away to follow Natty. 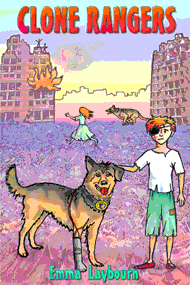 Behind him, the dog's eyes slowly opened, stared blankly at the two departing backs, and closed once more. Admiral Benbow lay awkwardly on the couch with his grey plastic foreleg stretched out before him. His nose twitched: the leg still smelt strange, four months after its fitting, and ten months after his old leg had gone. And he thought he would never get used to its appearance. It still gave him a heart-jarring shock every time he looked down. Beyond the alien scent of the leg drifted other, more familiar odours: disinfectant; bathwater, metal-scented from the tank; the comforting promise of reheated gravy for his evening meal. Hospital smells that cocooned him, lulled him, as did the reassuring clank of the approaching trolley and the nurses' chatter. Benbow turned his head drowsily to the window. His move to the convalescent wing had been a great improvement, for it meant his own room, no more tubes and wires, and a view that stretched right across the Fringes to the dark heart of the City. His eyes were drawn there now. The City's ragged towers were silhouetted against the sunset. A few sparse dots of light flickered here and there - cooking fires, whose glimmer made the surrounding darkness seem yet darker. "How are you, Admiral?" Nurse Browning entered, a little round swift bullet of a nurse. She marched briskly to the window and slammed it shut. "That's better!" she said, with a shiver. "I'm fine, thank you," said Benbow. "Fine." Benbow replied gruffly, not because of any difficulty speaking - his voice-box was undamaged - but because his leg was not, in fact, fine. His leg hurt. The stump itself didn't hurt, for the plastic leg fitted comfortably enough. It hurt where his leg wasn't. That was why the sight of the plastic gave him such a shock - because he could still feel the vanished leg. Cramps and aches and prickles needled the non-existent skin right down to the absent claws. "Jolly good," said Nurse Browning. "Here's tea." She slapped the bowl down, twitched at Benbow's blanket, fidgeted with his water, swivelled the ragged bunch of flowers that someone had sent him, and coughed several times. "You've got a visitor," she said suddenly. "I saw him downstairs. I'm not supposed to tell." "Then don't," said Benbow, folding down his ears. But she darted to his side and whispered in a hurried gust: "Garracker!" With that, she grabbed the trolley and shot out through the door. Benbow shook his head free of the word. His eyes turned back towards the view. Necklaces of buzzing traffic circled the Fringes around the City's edge, stringing outwards to the country, to the houses of the well-to-do in their walled and gated villages. But no traffic entered the City. How long, Benbow wondered, since the City had fallen into decay? Years before he was born, the shops and offices had started closing down, moving to new sites in the countryside, clean and vandal-free. The high tower-blocks emptied, slowly at first, then with gathering speed. As flats fell vacant, vandals smashed them up. The streets filled with broken glass and litter. Soon no-one wanted to live there any more. The college and the theatres were boarded up, the hospital closed down, buses stopped running. Gangs roamed the streets, looting and burning. At first the City Council tried to rebuild. But as soon as one tower-block was repaired, another would go up in flames. In the end they gave it up as a bad job, shut the Town Hall and moved out. The police went on strike, refusing to patrol the City streets. As rats and disease spread, even the gangs left, abandoning the tower blocks to the wind and rain. Barbed wire went up around the empty City. But it didn't stay empty. Lost and lonely children, the homeless and the runaways, crept through the wire with their dogs to form new gangs and make new homes in the silent tower-blocks. Theirs was a dangerous life; the burnt-out towers were crumbling year by year. Every so often one collapsed entirely, so that huge grey flowers of dust blossomed from the rubble. "Miss it, do you?" said a voice. Not the nurse's. But even without her warning, Benbow recognised it. He had heard it often enough over Elise's fuzzy radio, back at the City Police Station. "Garracker," he said. It came out as a bark. Garracker grinned. His teeth were white and perfect in a lined, tanned, handsome face. He closed the door silently and strolled towards the chair. "May I sit down?" He did not expect an answer. Carefully adjusting the knife-sharp creases in his trousers, he settled himself opposite Benbow, and crossed his legs. "I expect you want to get back to work." "I doubt if the service will take me back with this." Benbow raised his plastic paw. "Why not? It's the best leg money can buy," said Garracker. "I should know. I bought it." "You?" A growl rumbled in Benbow's throat. "Sure. Who else? Who do you think is paying for all this lot?" Garracker waved a careless hand at his surroundings. "Dogs' Benevolent Fund, they told me." "They're not as benevolent as this. I've paid for it, Benbow - with a reason." But Garracker seemed unwilling to go on. He jumped out of the chair and began to prowl around the room, as sleek and powerful as a big cat, despite the grey that speckled his black hair. Halting by the window, he stared out at the dusk. Benbow frowned. Garracker was rich; the richest businessman around. If his wealth came from crime - as was rumoured - it had never yet been proved in court. He had the Council eating from his hand. But this was the first time that Benbow had heard of his owning the City. "My City... It's beyond repair." "Not necessarily," said Benbow, pained. "Beyond repair," repeated Garracker, his voice harsh. He let the blind rattle down, shutting the City out. "I want to tell you what happened to your leg, Benbow." "Cut off. Beyond repair," said Benbow wryly. "But not beyond use," said Garracker. "Your leg was... used." "Used? How?" Benbow's mouth went dry. Garracker glared at him. "We cloned you, you numskull!" "That's illegal," said Benbow automatically. "Has been since 2024, unless you're a government laboratory." He realised too late that it was not a tactful answer. The man stared at him with eyes as hard as sapphires. "Don't tell me what's legal," said Garracker with quiet venom, barely opening his mouth. "We cloned you. Don't ask who did it for me. We didn't need the whole leg, but it was convenient to have so much to work with. We had three successes. Yes. Three nice little clones. Three perfect baby Benbows." Benbow could hardly speak. He felt as though he had just swallowed his dinner, whole, in the tin. "Why?" Garracker swiftly patted his shoulder. "Because I need you, Admiral! The police force needs you." "You don't run the City police," objected Benbow. "I do now. You think the Council can afford to keep them going without my help? You think they want to pay for any of the City's problems? I fund the police, and the Council give me a free hand." Garracker smiled thinly. "And you're the best dog we've got." "Not with three legs," said Benbow. The missing limb began to tingle and throb again. "So you made three new Benbows. Replacements?" "They're not designed to replace you, Admiral. How could they?" Garracker's kindly earnestness filled Benbow with deep distrust. "You're to work together. They're just pups still - fine young pups, and growing fast - but they need a teacher. A leader. You." "You. That's why I paid for all this-" Garracker swept his arm around again, knocking over the vase of shabby flowers, "-the surgery, the twenty-four hour care, the leg." Benbow was bewildered, and suspicious. His stay in hospital must have been a vast expense, and Garracker was not a man to waste money on good causes. "I don't understand," he said bluntly. "There are other police dogs. Excellent dogs, some of them voiced. Why does the City need three new Benbows?" I certainly don't need them, he thought. Garracker's eyelids flickered. "You're right, Benbow. Smart dog. There is something I haven't told you." Smoothly he walked to the door, and flung it open to survey the empty corridor. Closing it silently, he turned and stared at Benbow with unblinking eyes. Definitely cat-like, decided Benbow. No affinity with dogs at all. "I'm not prepared to tell you here," said Garracker at last. "Come to my office tomorrow morning, nine o'clock. Top floor, Prospect Towers." Benbow felt no inclination to agree. "I was assuming I'd retire." "You can't." The man's voice sharpened. "You're too young. You'll get no pension." "Who wants a crippled dog?" snarled Garracker. "You'll end up as a flea-bitten stray! And what about your clones? They're no use to me without you. No use at all. Might as well be rid of them." His eyes glittered. "Be there, Benbow." Without waiting for an answer, he strode out. Benbow looked down at his cold, expensive dinner congealing in its bowl. His appetite had gone. Now what? he thought. I could ignore him. Just leave; just disappear. But there were the clones. Three pups he didn't want. Did they really exist? If they did, how could he leave them to Garracker's mercy? Benbow shook his head. Picking up the fallen flowers in his mouth, he set them back in their vase. Then he pulled up the blind again. There was the City, waiting for him through all his long sleep. He had thought it must be lost to him forever. Now Garracker was giving him the chance to return. Of course he would obey. He had to go back. Benbow's new leg was the best walker of the four. The other three were weak from lack of use, but he sensed the plastic leg would never tire. The hospital was far behind him now. Prospect Towers was still two miles away, thirty minutes' brisk walk through the business zone: the office blocks of mirrored glass and concrete, built by Garracker a safe distance from the City. But Benbow did not want to go that way. Cold gales blew between the office blocks, and there were no dogs apart from rushed and edgy errand hounds. So Benbow chose the long way round, looping through the Fringes: the bleak estates that encircled the City, just outside the wire. He plodded through squat ranks of housing blocks adorned with tattered lines of washing. No-one lived in the Fringes if they could afford somewhere better. Shouting children chased each other through playgrounds in which every swing and slide was broken. Still, thought Benbow, at least these children had homes. Families. This wasn't the City. A pair of dogs came trotting up to sniff a casual welcome in a way that City dogs would seldom do; and they did not shy away at the sight of the police badge on his collar. "What's new round here?" Benbow asked them in Dog, a combination of barks, head tilts, and tail position. For of course these dogs were not voiced, and while they probably understood Human, it would be impolite to address them in it. "Oh, nothing much, Officer," said the foremost dog, a nervous whippet. "Nothing new, couple of stolen cars, dog fell off a balcony and broke a leg, we had a murder the other day." Benbow's shaggy ears pricked up. "A murder? Who?" "Oh, just a man. His dog was all right. It was a shop-keeper - two other men took all his money, stabbed him and ran off, into the City." "Laughing," said the second dog, a quiet mongrel. Benbow nodded. "They won't laugh long, in there." A year ago it would have been his job to hunt the murderers down, get them out of the City and into jail. "Anyone else gone under the wire?" "A few," said the quiet dog. "Three children and a collie. Usual thing - father in prison, mother dead. A couple of runaways last month. Two girls. No dogs." "Thanks," said Benbow. Nothing had changed, then. "Heard about our monsters?" offered the whippet eagerly. "Big machines, black and yellow." The dog made a get-off-me-wasp gesture. "Down by the City fence. They've been hanging around there for months!" "Will you show me?" asked Benbow. The two dogs willingly agreed. Leading Benbow through the dingy streets, they scampered over a rubbish tip and wriggled under a tangle of barbed wire. Benbow found himself looking across a wide ribbon of wasteland to the cracked and broken teeth of the City towers. Nearby, as promised, stood three monsters, caged inside a tall wire fence: huge, metal vehicles, armed and clawed, poised like giant predators ready to attack. Beneath them dozed two Rottweilers. At Benbow's approach, the guard dogs woke with a start. Leaping to their feet, they barked terse warnings through the wire. Benbow raised his head to reveal his police badge. "Whose are these machines?" "Ours!" "Go away!" barked the guard dogs. "They're for knocking down buildings," said the quiet mongrel wisely. "I've seen 'em do it. Knocked down a house in twenty seconds flat. I think they were just trying them out." Benbow scrutinised the huge machines. The two clawed ones were earth or rubble-movers, he guessed. The third one was a lanky crane. As he stared at them, a sudden movement caught his eye. From behind the crane, two small humans emerged. They scuttled over to the surrounding fence, and began to climb. "Are you blind?" barked Benbow at the guard dogs. "Look! Intruders!" The Rottweilers spun round, and barking heroically, raced over to the fence. But the intruders had already scrambled too high up the shivering wire for them to reach. They leapt and snarled in vain. In a moment the humans were astride the fence, and starting to climb down on the outside. They were small and nimble: only children. "Quick," said Benbow. "Intercept!" He began to lope around the wire enclosure towards them. His new leg did not run as smoothly as it walked, and he was soon overtaken by the whippet, who yapped nervously at the children. Benbow saw them clearly now: a boy and a girl. The boy jumped down, dashed past the flinching whippet, and raced off with Benbow and the mongrel in pursuit. At peak fitness, Benbow could outrun any human with ease. But now, to his dismay, he realised that not only was he dreadfully unfit, but that his plastic leg slipped and juddered with each stride. The boy was getting away. "Stop!" yelled Benbow, in Human. For an instant, the boy slowed in surprise. The instant was enough. Benbow pounced. He leapt upon his back, bringing him down carefully, but firmly, a leg planted on each sprawling limb. "Name!" he barked. The boy twisted vainly beneath him. "I said Name!" And then the plastic leg collapsed. It snapped out of its socket and sent Benbow lurching sideways. At once the boy writhed out from underneath him, scrambled to his feet and sped away. The mongrel chased him; Benbow couldn't. He tried to run on three legs with the fourth dangling, and had to give up. He lay down, panting, and watched the girl take a flying leap off the fence. Ponytail streaming, she sprinted past the whippet, who bounded alongside her, yelping, "Oh, please stop! Please stop!" "Halt!" barked Benbow, trying to get to his feet again. "You're under arrest!" The girl didn't pause, but raced fleetly after the boy. Although the mongrel and the whippet gave chase, they were too small to hinder the children. The pair of them ran into the shadows of the City, and were gone. The dogs gave up and came trotting back to Benbow. "Sorry," panted the mongrel, "I'm not big enough to bring them down. And I'm not following them in there." "Never mind," said Benbow. "You did well. Thank you both." He was struggling to replace his false leg. At last he thought he'd done it, and stood up cautiously. The leg felt fine. Benbow felt terrible. I got that wrong, he thought. Should have let the boy go, caught the girl instead. Now I've got neither. This isn't going to work. Not just the leg. Brain as well. I'm rusty. He hobbled to the fence where the guard dogs waited sheepishly. "Never smelt 'em!" they barked. "Didn't know they were there!" "Well, at least they didn't get away with anything," he said. "Their hands were empty. So I shouldn't worry." Just as Benbow finished speaking, the giant crane blew up. Smashwords. You can buy the ebook there too. Go to the list of books and stories.